Hello co-designers! I’m pleased to announce that in the Spring of 2019, the co-design studio will be organized as an advanced practicum around the theme of “hacking hackathons,” with a goal of developing shared knowledge and best practices for organizing radically inclusive design events. Projects may be individual or team-based. General description: The Civic Media Co-design Studio is a service-learning, project-based studio course in collaborative design of civic media. Students partner with community-based organizations to create civic media projects grounded in real-world community needs. The course covers co-design theory and practice, including methods for community participation in iterative stages of project ideation, design, prototyping, testing, launch, and stewardship. If you’re interested in joining us, please fill out this short form: http://bit.ly/codesign2019-interest. The Civic Media: Collaborative Design Studio (Co-Design Studio: http://codesign.mit.edu), based at MIT and working in collaboration with partners in multiple locations, generates civic media projects that are grounded in real-world community needs. We partner with community-based organizations, and use co-design and lean startup methods for project ideation, design, prototyping, testing, launch, and stewardship. In 2016, our partners will be worker-owned cooperatives. What is the Co-Design Studio? The Civic Media Co-Design Studio at MIT works to create civic media projects grounded in real-world community needs. We partner with community-based organizations and use co-design and lean startup methods for project ideation, design, prototyping, testing, launch, and stewardship. There’s growing interest in worker cooperatives as a powerful form of re-organizing the economy. If we’re going to ‘disrupt’ every sector with apps, why replace today’s crappy boss with another crappy boss tomorrow? Let’s disrupt the whole model and build a stronger, more democratic, more just, and more sustainable economy! “Worker cooperatives build community wealth and help make a democratic economy real,” since workers have a direct role in decision-making and a share of all profits. For more info, see platformcoop.net and www.usworker.coop. The Co-Design Studio is organized by Sasha Costanza-Chock, Associate Professor of Civic Media at MIT and worker/owner at Research Action Design (RAD.cat). This year Evan Henshaw-Plath will work with us to share lean UX and lean startup methods. Additional resource partners may include RAD.cat, MIT CoLab, and more. TBD. Likely candidates include cooperatives of home health aides, bicycle delivery, and gardening, among others. (Possibly) launch a lean co-op startup incubator! We’ll kick it off in February 2016, and see how long it lasts! We’ll be running a course at the MIT Media Lab. We’re hoping that others will run similar courses in parallel. We’ll also be organizing and promoting a DiscoTech/hackathon/design jam that will take place at multiple locations around the world. For updates see codesign.mit.edu. What will happen to the projects you make? They’ll be owned by the cooperatives we partner with, and also released as Free Software and Creative Commons content. That depends on who you are and how much time/energy/resources you want to commit! Run your own co-design studio with worker-owned cooperatives! (We’ll provide some resource materials based on our own process that you can use or remix as you see fit, and we’ll host video check-ins for teams that are working in different locations). Attend (or organize!) 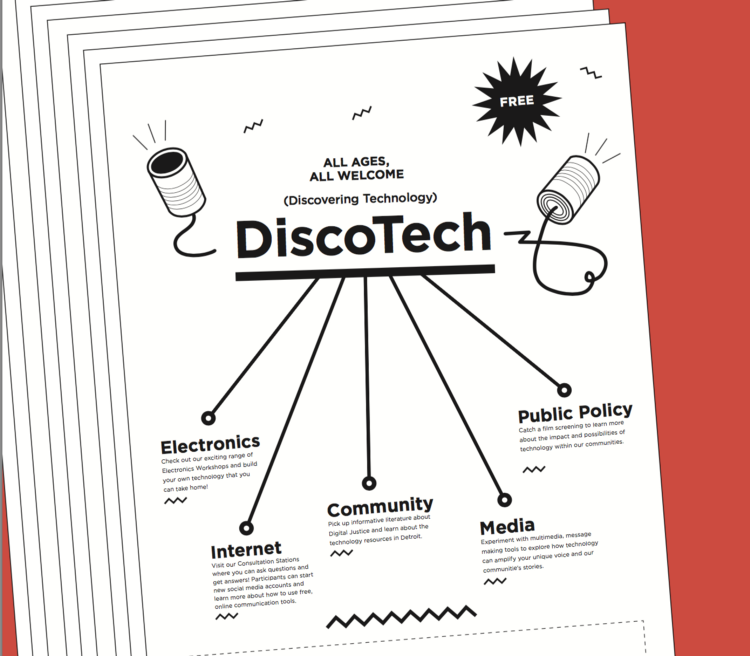 a DiscoTech, Hackathon, or Design Jam focused on worker-owned cooperatives (dates TBD). Co-Design: Cooperatives! Preparing for the Spring 2016 Co-Design Studio. We’re pleased to announce that in the Spring of 2016, the Co-Design Studio will be partnering with worker-owned cooperatives in low-wage sectors. We haven’t finalized partners yet, but most likely we will collaborate with cooperatives of home health aides, gardeners, and possibly a bicycle delivery coop. Stay tuned, more soon! In the meantime, you can learn more from the U.S. Federation of Worker-Owned Cooperatives. Live Stream from Project Partner presentations! New Posters for the Codesign Studio! Becky Hurwitz made these amazing posters, click to download them (print quality)!